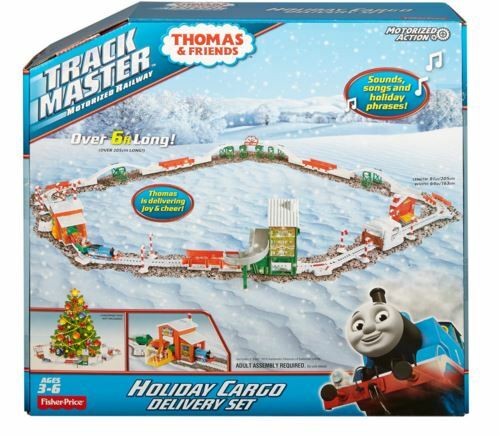 Thomas the Train Trackmaster Holiday Cargo Delivery Set – HALF OFF and delivered by Christmas!! If Santa hadn’t already gone waaaaaaay overboard for Bug, he’d be ALL OVER this deal! If you have a Thomas the Train fan in your life, then you’ll love this deal and appreciate the awesome price! Ohmygoodness…the more I look at this the more I want it under my tree on Christmas morning!!! Includes complete holiday-themed track layout with motorized talking Thomas, Sir Topham Hatt’s house, candy cane factory, tunnel, school, and three stop-tracks. Accessories include Sir Topham Hatt dressed as Santa, 3 cargo cars, barrel of candy canes, holiday gift cargo, and decorative track-side candy canes. Talking Thomas delivers sounds and phrases as he races along. When Thomas pulls through Sir Topham Hatt’s house, Sir Topham Hatt pops out from the side dressed as Santa in his sleigh. It will only be 50% off for a limited time! Get it now! Next post: Dealspotr: I’ve Earned $15 in Amazon Gift Cards – Why Haven’t You Joined?